Reviews of The Beggar’s Opera! Reviews of The Poisoned Pawn! "Ramirez is an appealing character who uses his Canadian connections to augment his sleuthing..."
"Crisply written, the characters are real ... Blair enters the world of the thriller." "Peggy Blair’s Inspector Ramirez series gets better with every book. 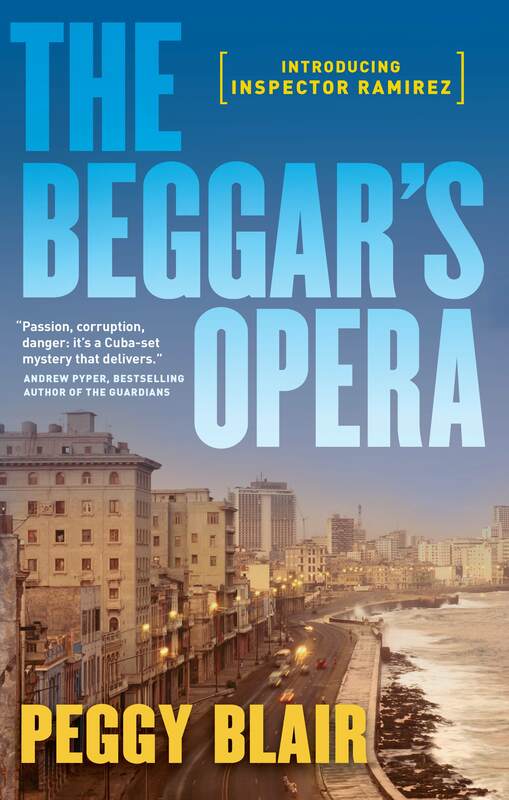 An Ottawa lawyer, Blair has a real knack for using her Havana setting, with its eccentricities born of necessity, as both a charming backdrop and a real guide to plot lines. "This time out, Ramirez begins with a confrontation with Mama Loa. The witch doctor says people in the sky are going to die. Ramirez isn’t convinced. There hasn’t been a murder in Havana in weeks and who cares about clouds in the sky? "When the prophecy kicks in (expertly done) there’s not just one, but several connected killings and yes, the sky is there, too. But this is no local curse or a shot of voodoo. This is plain old-fashioned KGB-CIA hit man-style killing. That makes it political, not personal, and Ramirez knows he’s on borrowed time." "Marvellously accomplished ... Cuba is a small triumph of evocation. "Blair manipulates the new characters in the book with the finesse of a card dealer dealing a hand from the bottom of the deck." "Blair's mastery of intricate plotlines means that I didn't even guess at the extent of the machinations until the very end. "And yet it all seemed to make sense once it was explained -- the very different storylines all connected in a great ending -- which was very cinematic in scope, and again, quite spy thrillerish. "All in all, you'll find warmth, friendship, terror, clandestine plots, violence, explosions, and true love in this story. The perfect summer read." "Blair's thriller never disappoints ...This series, with its study of seemingly disparate cultures that actually have a lot in common, continues to be a delight." "A charming and funny, but also poignant, series. " "Blair's plotting is meticulous, inventive and oh so well played ... an excellent addition to a wonderful series. Absolutely recommended." "Top-notch mystery ... A new level of sophistication. Hungry Ghosts is one of the best mysteries to come out of Ottawa this or any year. " "Terrific cop characters Ricardo Ramirez and Charlie Pike -- intrepid, quietly anti-authoritarian investigators relentlessly sleuthing in their isolated corners of the world--and locations in non-touristy Cuba and the impoverished Canadian Shield make for a cracking good read." "Blair grows more assured with each novel ... she shapes all the elements in each of the three plots into coherent and related whodunits. "As a bonus, Blair rewards readers with enlightenment about the perils of ordinary life both in Cuba and on Canadian aboriginal reserves." Mass paperback (Canada and the US)! Mass paperback (Canada and US)! REVIEWED BY THE NEW YORK TIMES!!!! "The Beggar's Opera is a well-crafted procedural with a detective who is haunted by the victims in his homicide cases. Inspector Ricardo Ramirez of the Cuban National Revolutionary Police returns in The Poisoned Pawn. Ramirez is a wonderful guide — hiding nothing but hoping we’ll look past the poverty, hardship and political corruption to see the beauty and humanity of his battered city." REVIEWS OF MIDNIGHT IN HAVANA! "I am a bit of a sucker for the weird and unusual and a taste of the exotic, so when I saw this script I sat up and took notice. "Set in contemporary Havana, we are introduced to the major crime unit of the Cuban National Revolutionary Police led by an inspector who sees the ghosts of unsolved murder victims who in turn is assisted by a dwarf pathologist who needs a stepladder to be able to conduct his autopsies. "Although handicapped by a creaking bureaucracy, intermittent internet and a lack of pencils, the policemen’s resourcefulness, dark subversive wit and profound intelligence more than compensate for these shortcomings. "A compelling mystery with brilliant characters and a fantastic setting this is a spellbinding whodunnit. But above all a book of immense humanity." “All the ingredients of the best detective novels." "A poignant yet pacy mystery. The major, and the minor characters, leave the reader wanting more - in the best possible way." "Canadian author Peggy Blair's debut novel (originally published in Canada under the title The Beggars Opera) is a treat. It's a fast-moving, original and atmospheric mystery." “Blair has found a winner in crumbling old Havana with Ramirez, a man haunted both by his country and unsolved crimes." My first advance from Penguin! Yes, I’m a realtor, too!